The 2014/2015 Draft is a high-performance, freeride kite that generates powerful lift for boosting big airs and long, gliding jumps. 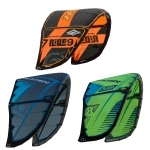 It features a state-of-the-art airfoil design that excels at hooked-in riding, upwind performance and competitive speed. The Drafts reduced leading edge taper adds rigidity to the wing tipplacing the axis of rotation close to the center of the kite, resulting in sharp turning and precise bar feel. The five struts on the 7, 9, 10.5, and 12 sizes optimize performance and increase control in strong winds, while the three struts on the 14 and 17 sizes are ideal for light wind performance, smooth power delivery, and faster turning. This year, the wing tip shape has been changed in order to provide a more direct bar feel and quicker turning. And the bridles have been refined to provide faster turning, more aggressive jumps and bigger airs.